Mr. Heitz served as a former Regional Counsel with the Eighth National Bank Region for the Comptroller of the Currency (OCC). He has practiced as both a General Counsel for a large Texas Holding Company and as a member of well-respected law firms in both Dallas and Fort Worth, Texas before following his entrepreneurial instincts and starting his own practice in 2005. Mr. Heitz is highly regarded by bank regulators and his financial institution clients. He has testified as a banking expert in jurisdictions throughout Texas. 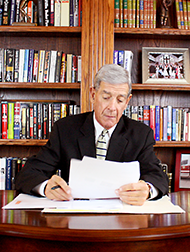 Bruce Heitz has over 40 years of experience representing all sides of regulatory issues, including governmental, commercial, corporate and individual matters. After graduating from the United States Naval Academy with a BS and Columbus School of Law with a Juris Doctor, he began his career representing the United States Marine Corps and then the Office of the Comptroller of the Currency. He represented the OCC in enforcement and compliance matters and acted as Regional Counsel in the Eighth National Bank Region issuing oral and written opinions dealing with national banking, consumer laws and policies of the OCC. He served as General Counsel & Secretary to the Board of Directors for a well-known multi-bank holding company in Texas with over $6.4 billion in Assets. Bruce was engaged as legal advisor by the United States Agency for International Development to conduct a study of the legal and regulatory framework for the governments of Macedonia and Moldova, as they developed their bank regulatory structure. Upon completion of this assignment, as a Legal Advisor for Prudential Regulations, he made recommendations to the National Bank of Macedonia as to specific areas where laws or regulations would be appropriate. Upon completion of this assignment, Bruce continued on in private practice in the Dallas – Fort Worth area. In mid-2005, Bruce opened his own office and law firm continuing to serve a variety of clients with respect to his bank law and regulatory experience.